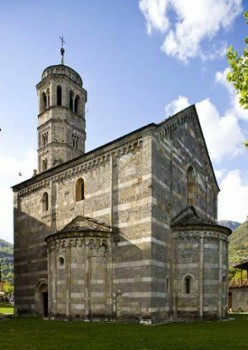 The extraordinary Romanesque church of S. Maria del Tiglio, that stands approximately 800 m left of the boat dock. 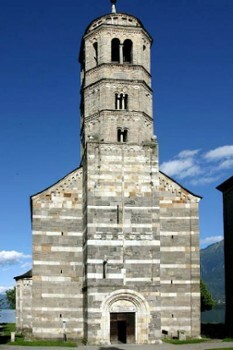 It is one of the most important Romanesque buildings of the province. 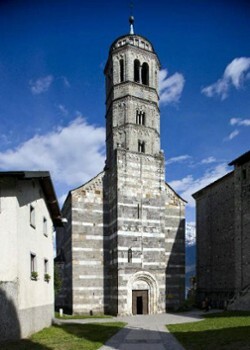 Built in the XII century it preserves precious frescoes and a wooden crucifix. 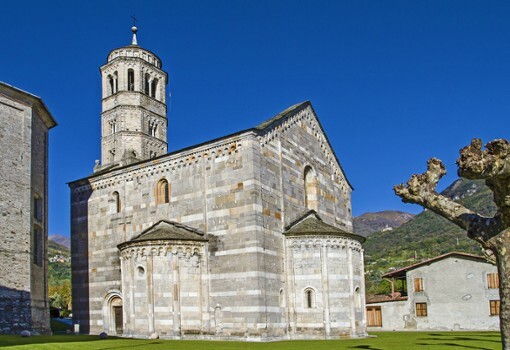 The wall face with grey, white and light pink stones and the articulate interior with blind arcades and loggia are extremely beautiful. 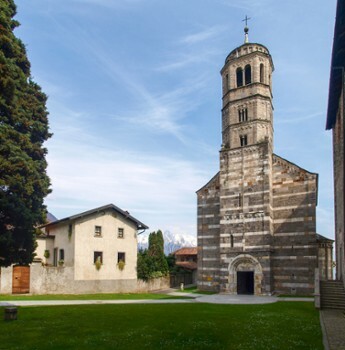 The church stands on what is known as the ''sacred area" of Gravedonna, which also includes the nearby parish of St. Vincent, the latter characterized by a remarkable Romanesque crypt. 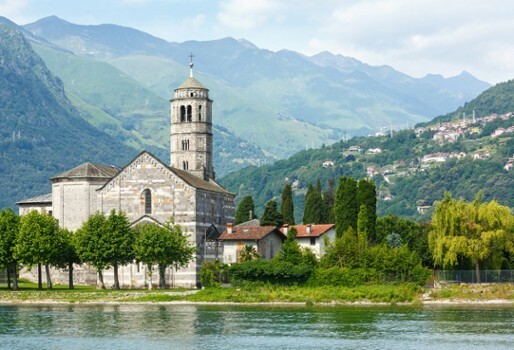 Probably this was a place of worship in Roman times and the church was perhaps used as a pagan temple. It was mentioned for the first time as a baptistery, dedicated to St. John the Baptist in the Annals of Fulda, that documents a miraculous fresco, depicting the Adoration of the Magi, which for two days shone with its own light. 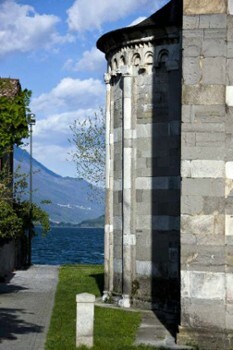 When one enters the church, prayer comes spontaneously. The absence of colour does not make a negative impression, in fact in an era like ours where everything is a pretext for painting, one realizes how homely and friendly the stone can be. 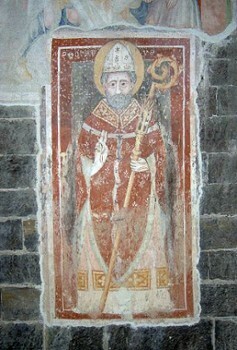 After having sung, the stone suddenly colours and communicates through the XIV and XV century frescos in which we recognize the cycles of: "St. John the Baptist" and "The Wise Men", a "Crucifix" and a "Holy Trinity", "The Adoption of the Wise Men", an episode of the "Life of St. Julian", "The Holy Virgin between St. Nicholas and another Saint", "St. Gothard", "St. Stephen", "St. Christopher". Also of great iconographic interest is the fresco of "The Day of Judgement", with Giottesque traces to be seen. Below, the denomination of the seven vices and seven virtues, seems to show in the two groups of people above, the condemnation of Christ Judge whilst Jerusalem is represented by the village of Gravedona. 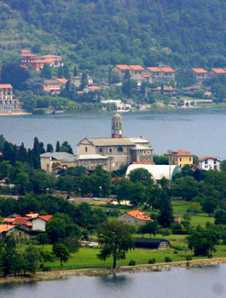 Nearby Things to Do include: Towns such as Gravedona and Domaso; Water Activities such as Rent a Boat Newton and Windsurf Centre Domaso; Hiking/Climbing Guides such as Hiking Como Lake; Villas such as Gallio Palace and Villa Camilla; Churches such as San Vincenzo and Sant’Abbondio; Museums such as Dongo Resistance Museum and Palazzo Manzi.